DrawCallMonitor helps you to evaluate the performance of your FSX MDL objects. 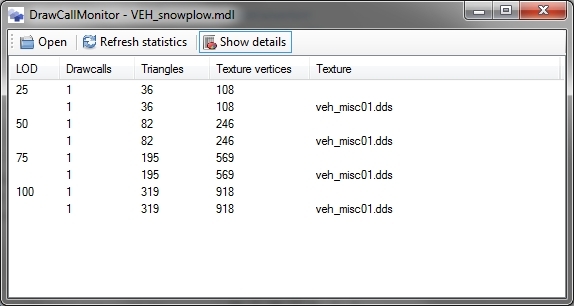 It shows you the amount of drawcalls and texture vertices as they are stored within the MDL file. Thereby it can give you useful information on where you should start optimizing your object. The latest release of DrawCallMonitor is version 1.2. This version is available from the development releases package. You can find the DrawCallMonitor manual on the FSDeveloper Wiki. Copyright © SceneryDesign.org 2019. WordPress theme by Ryan Hellyer.